"I heartily endorse Asian Access as you are filling a vital need in the church in Asia. The emerging urban church leadership is dynamic yet fragile. They have no older generation of pastors to look up to. 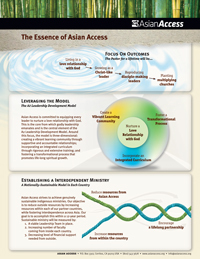 Asian Access' proven mentoring approach builds communities of leaders, providing needed accountability and encouragement while developing personal character and ministry skills." What do we want to see as the result of our work in the life and ministry of each participant? The fifth unspoken outcome of launching a church multiplication movement is entirely up to God. Yet, with His blessing, the first four outcomes can actually result from specific steps Asian Access takes. In other words, there are practical things we can do in structuring our program in order to help achieve these outcomes. Who are the Asian Access participants? 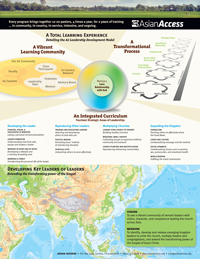 This one-sheet, double-sided flyer outlines the Essence of Asian Access in terms of our four desired ministry outcomes, the A2 leader development model and our ultimate goal for sustainable ministry in each country. Do you ever feel like your life follows the pattern of this biker? We make our plans but they often go in much different ways! Today, listen to Pastor JE from Chennai, India share how Asian Access is making a difference! In this video Jeyakaran will share how Asian Access is investing in pastors through their character development. This work is foundational as a leader in the church because in order to make disciples, a leader must first be a disciple – one who is deeply rooted in his relationship with Jesus Christ. A2/Cambodia just graduated Class 4 and the stories of life change from the pastors were powerful. Many of them personally asked me to thank you for investing in them. As they shared the stories of transformation, it reminded me of Asian Access return on investment. We hope to see pastors for a lifetime who live out the Essence of Asian Access.